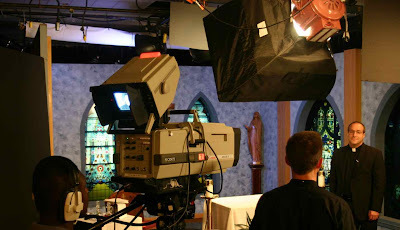 “Feed My Sheep” is hosted by the Director of CatholicTV, Father Robert Reed. This series was originally broadcast several years ago, and was Father Reed’s first series as Director. What motivated you to look to the priesthood? Describe some of the significant moments of your priesthood. As a priest, what keeps you going? How has the crisis in the Church changed you? What person has had the most significant impact upon your ministry as a priest? How has and does the celebration of the liturgy and the mystery of the Eucharist affect your priesthood? Since you are busy and days can be long and prayer is work and takes time, how do you remain a man of prayer? What are the most important aspects of your life and work as a priest? How can we, how do you foster vocations to the ministerial priesthood? What kind of man does it take to be a good priest? When you meet Jesus face to face, what words would you expect to hear and why? These priests are involved in a variety of ministries including Theology on Tap, campus ministry, fire department chaplaincy, and many others. The weekly CatholicTV schedule is as follows (Eastern Time): Monday 3:30 PM, Friday 5:30 AM Saturday 11:30 PM.